The portrait of a woman in a dead-end job, with a bad-news husband, and an unexpected bun in the oven isn’t usually the stuff of big musicals, but Jessie Nelson (book) and Sara Bareilles (music and lyrics) adapted Adrienne Shelly’s screenplay for the stage, showing an everywoman’s highs and lows deserve a delectable telling. If the protagonist, Jenna (Joanna Ampil), sounds familiar and her story predictable, it’s not because it follows a slew of similar musicals that came before it; it’s the realism of the woman with limited options. It might even be more resonant here in the Philippines, where expectations of and options for most women still aren’t all that different from this very middle-America diner waitress with a southern drawl. This parallelism is what makes Bobby Garcia’s staging of this musical on these shores with a Filipino cast especially poignant. Here is Jenna, warm and humble and ‘happy enough’ dealing with the hand she was dealt, and watch as she finds the strength to save herself from her circumstance and live a better life. 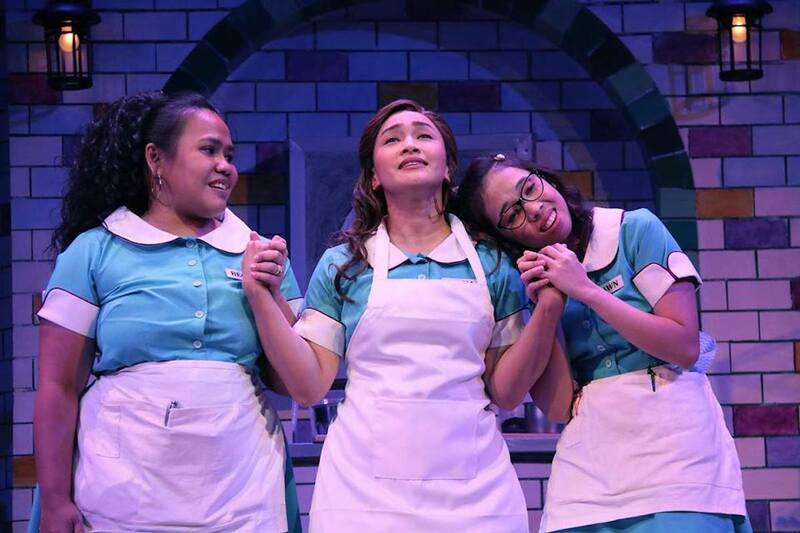 In Joe’s Pie Diner where Jenna works as waitress and piemaker, she’s found a family in her friends Becky (Bituin Escalante) and Dawn (Maronne Cruz). Together they form a solid trio of female friendship, and a source of constant support. There is also the fry cook, Cal (Dean Rosen), whose bossy energy give harmless foil to the three women. The diner’s owner, Joe (Steven Conde in old man prosthetics), also frequents the establishment as a curmudgeon with a heart of gold. Jenna’s home life is different as the wife of a demanding and possessive Earl (George Schulze). She longs to get away from him, but with her husband taking all her earnings, and an unexpected baby on the way, she finds herself backed into a corner until she was told of a pie-making contest with a prize money that will help her move away. She also meets the young Dr. Pomatter (Bibo Reyes), and with all the new pressures and possibilities in her life, she is driven to romantic impulse. The supporting cast deliver each of their big numbers to great merit. Cruz show her comedy chops in “When He Sees Me”, as does her romantic interest, Nino Alejandro as Ogie, in “Never Getting Rid of Me”. Escalante brings the house down with her powerful performance of “I Didn’t Plan It”. Conde’s “Take It From an Old Man” is sweetly nostalgic, though the role would have been better served by an age-appropriate actor. The company together in numbers with high energy and movement (choreographer is Cecile Martinez) were also enjoyable to watch. The performances of the two actors as the contrasting men in Jenna’s life were especially noteworthy. Reyes breaks out as the besotted Pomatter, exhibiting a charm that’s befitting of the very best of romcom leading men. Schulze, too, is memorable as Earl who is infuriating at best and terrifying at worst. His character work heightens the plot’s sense of urgency, helping make Jenna’s misfortunes all the more devastating (especially in “You Will Still Be Mine” and the run up to “She Used to Be Mine”) and her triumphs all the more cathartic for both her and the audience. Ampil gives an almighty performance as Jenna, reaching its apotheosis in the show’s emotional climax, “She Used to Be Mine”. She sings this song with pure emotion that is nothing short of breath-taking; each line of Bareilles’s lyrics about a woman’s pain for how her life turned out searing and gut-wrenching and clear. That Garcia tapped Ampil for a character historically played by women in their early 30s gave depth to this particular song. This Jenna’s situation is a little more dire, a little more urgent. In this number’s crescendo, when she laments with honest and emotional yearning for another chance, it made Bareilles’s poetic lyrics all the more moving and poignant. The emotional impact of Ampil’s Jenna reverberates through the rest of the musical, evoking emotion that pulls the audience to feel for her and root for her, that when she finally declares that she no longer wants to simply be ‘happy enough’, but ‘happy’, you swell with joy and delight right with her. It’s a heartwarming tearjerker of a musical, that serves up lessons on innate female strength and even the transformative power of motherhood. Its strength lying on its more emotional moments. David Gallo’s whimsical set design of a diner set against bright blue skies is a sight to behold. 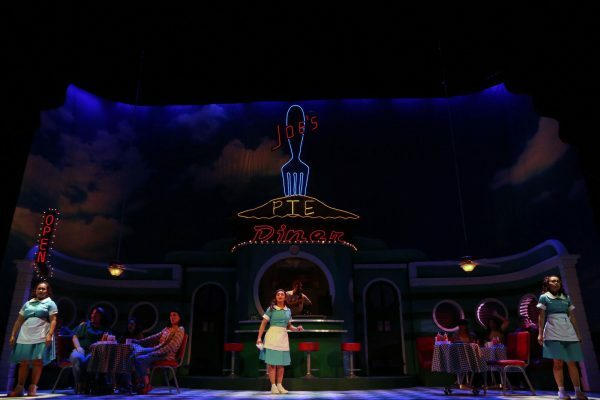 The diner is detailed, the colors are vibrant (including Raven Ong’s costumes, even for ensembles in everyday wear)–a charming picturesque setting that hint at a exuberant spectacle. It’s even framed in a pie crust. 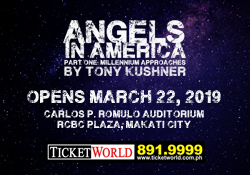 In some ways, the story told on his beautiful, candied set felt all too real that it’s almost an ill-fit (Aaron Porter’s lighting goes a long way to transform the stage in tone and mood), but Gallo’s cheery production design along with musical director Farley Asuncion’s melding of this sweet-as-pie feel and Bareilles’ enchanting music help sell Waitress as ultimately a story of hope and happy endings. 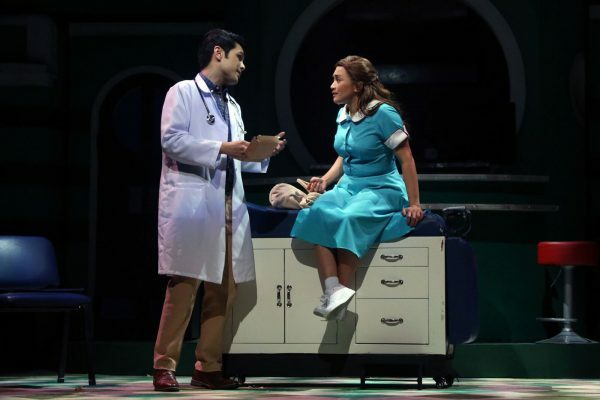 There’s true emotional payoff in this production that gives the audience more than just entertainment and bang-for-their-buck production value; Waitress is greater than the sum of its delectable parts. This pie was expertly made, and served up with a special ingredient: heart–and it made all the difference. Previous Full ‘The Greatest Showman: Reimagined' Album Out Now!